A bunion is a mal-alignment of the two bones that form the base joint of the big toe. Due to this mal-alignment, the big toe begins to angle inward towards the other toes, thrusting the base joint out further in the opposite direction. Risk factors include genetic predisposition, weak connective tissue, wearing tight narrow shoes and especially high heels. Bunions are more prevalent in women. Below are common signs and symptoms of bunions, which vary from person to person. The Manchester Scale is a noninvasive self-assessment tool for you use and evaluate the severity of your bunion on a scale of 1 (no bunion) to 4 (a severe bunion). Once you rate your bunion, you’ll be able to find the bunion treatment that works best for you. By comparing your feet and big toe to the Manchester Scale images below, you can establish your level of bunion severity. Did you know that when you push off your toes while walking, the joints in the ball of the foot carry three times your body weight? When there is increased pressure on the ball of the foot, normal weight distribution is disrupted causing pain and inflammation. There are many causes of ball of the foot pain, including wearing high heels, high impact sports, excessive body weight (obesity), stress fractures, high arches and bone abnormalities of the feet. Below are common signs and symptoms of metatarsalgia, which vary from person to person. Stress fractures are common among runners, dancers, military personnel, athletes and anyone who is constantly on their feet. Stress fractures are usually caused by ‘overuse’ or repetitive action on the bone. They are most common on weight bearing bones of the lower leg and foot. A hammertoe is a permanently bent toe, usually one of the four smaller toes. Over time, hammertoe(s) become more bent due to prolonged squishing against tight, narrow or high-heeled shoes. Hammertoes can also be caused by bunions, which crowd the toes as well. Eventually, the muscles in the toe(s) won’t be able to straighten. Severe hammertoe will actually start to cross over the next toe. Claw foot occurs when the arch of the foot is extremely high and the toes bend downward, making the foot look like a claw. An overstretched tendon that supports the arch of the foot or an untreated childhood flat foot condition can result in fallen arches or flat feet. While walking, fallen arches cause a person’s foot to roll inward (over- pronation). Over-pronation negatively effects the way you walk which in turn can lead to problems with your joints, balance, knees, hips and gait. Arthritis is inflammation of the joints. It is a degenerative condition of the cartilage and generally occurs with age. When the mechanics of the foot have shifted in a way that places excessive stress on the joints, the cartilage that protects your joints starts to break down creating friction and inflammation. Foot arthritis is very painful because the feet support a person’s body weight. Common causes of foot arthritis are heredity, foot injuries and infection of the joints. Wear a strong adjustable arch support brace that can control the flattening of the foot and reduce stress on arthritic joints. 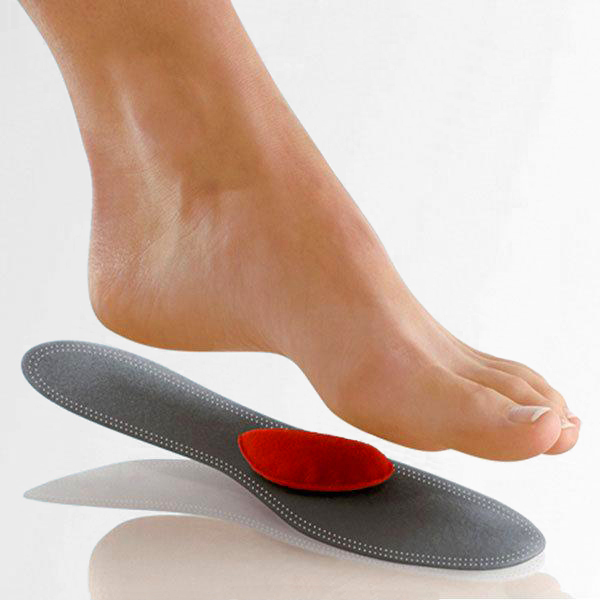 Use a firm insole with an arch support that helps brace the foot and decreases the workload on your joint. Take anti-inflammatory medication, exercise and physical therapy. Hallux varus or sandal gap is a deformity of the great toe joint where the hallux is deviated medially (towards the midline of the body) away from the first metatarsal bone. The hallux usually moves in the transverse plane. Hallux varus is typically a major complication from bunion surgery. Overcorrection causes the big toe to shift outward. Signs typically show up within the first week post-surgery. Other causes include trauma, injury and congenital deformity. Splint the toe immediately using the Bunion Aid® Post Surgical Splint to prevent further shifting, provide pain relief, protection and correction through range of motion. Consult your medical profession. Potentially, you may need to have Hallux varus surgery to straighten the toe and then splint immediately to prevent further shifting.